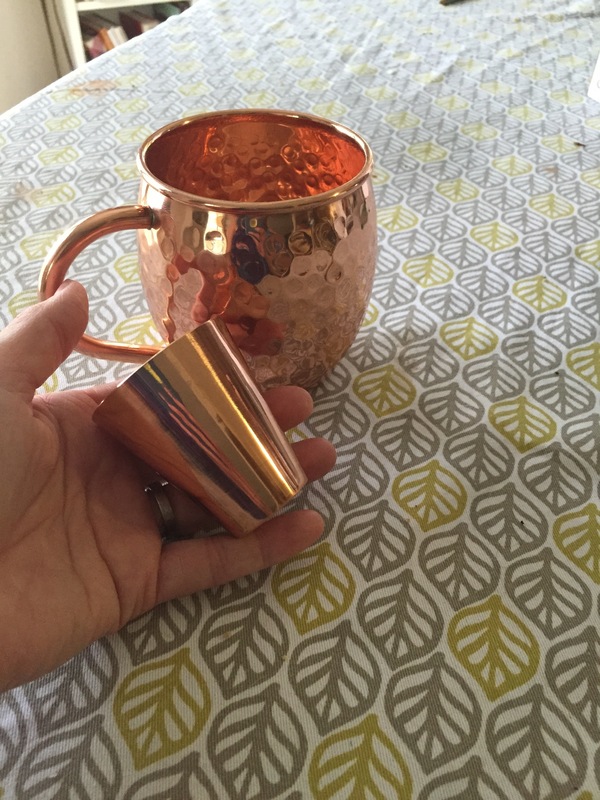 I recently ordered this great spin cup from Amazon for my sweet 3 1/2 year old nephew B. It is awesome in that it the top spins while he is drinking. I love that it encourages him to more water. He loves it and so do I! I highly recommend this as a great way to encourage kiddos to drink more water, but look out Uncle B liked it too! I am so excited to be updating our downstairs bathroom. We recently installed the #aquadance 6 function shower head and we love it. The shower is small, really small, so having a fixed mount showered is great because it takes up the least amount of room. Installation was easy peasy. Just a few minutes and I did it! This is a 2.5 gallons/minute shower head but also has a water saving function. Our new Aqua Dance Fixed Mount 6 Function Showerhead in Chrome/Gray not only looks great, but is easy to use. I highly recommend this! It is summer and lemon is such a wonderful light flavor. It is the essence of summer. I have been craving lemony summery deliciousness. Plus I needed to find a delectable lemon cupcake as I will be making cupcakes for a friends wedding in August. Lemon is one of the flavors I agreed to make. I don’t do boxed cake mixes…unless in a dire situation. 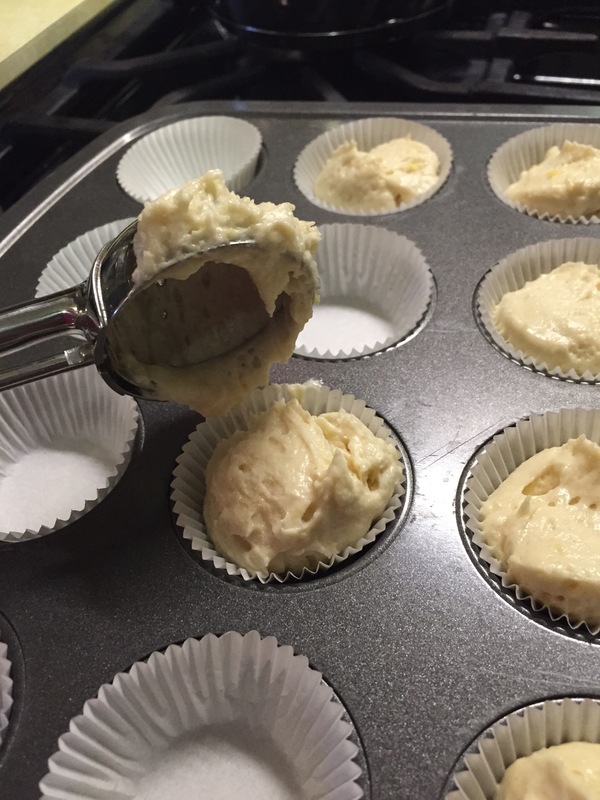 When evaluating a lemon cupcake recipe I want something that is light and airy and smack you in the face lemony. I don’t want anyone to ask what flavor the cupcakes are. I want you to know right away! After some Pinterest research I decided to try this Lemon Cupcake Recipe from Cooking Classy. 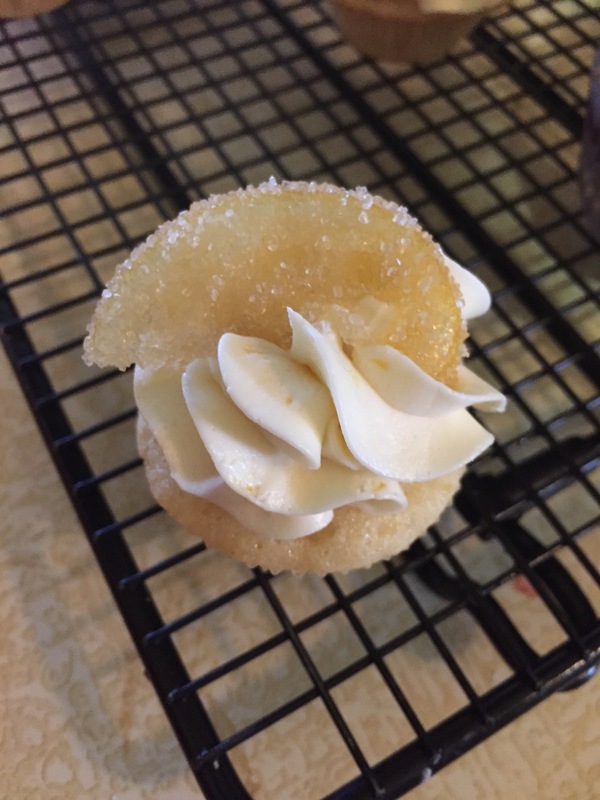 It is a fantastic light airy lemony cupcake recipe. 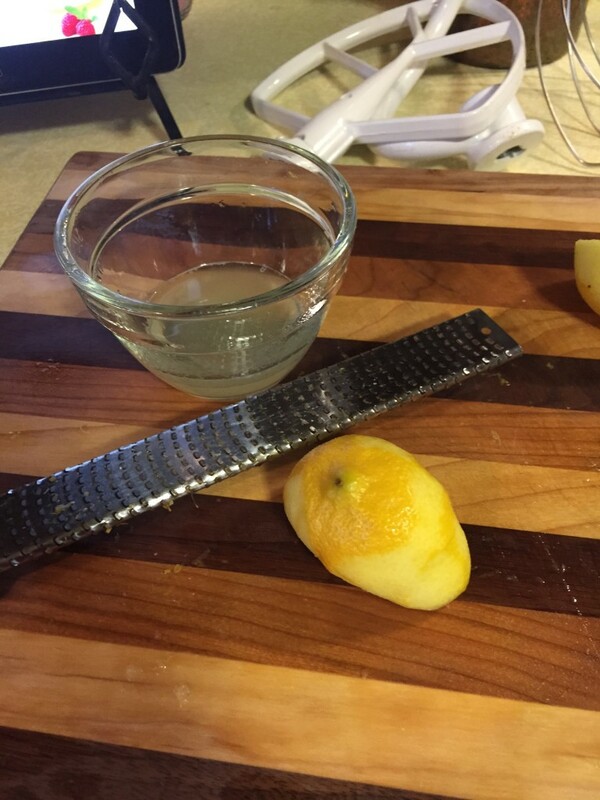 It takes some work in zesting the lemons, but worth it. This is probably one of the best lemon cakes I have ever made. Too often they are short on lemon flavor or coarse and heavy textured. When these come out of the oven, they are brushed with a beautiful lemon syrup. This adds not only more lemon flavor, but keeps them moist and delicious. If I were making these for a more exclusively adult event, I would probably use limoncello. Once cooled they are filled with owie-gooey lemon curd. In the middle of my lemon cupcakes is Ina Garten’s Lemon Curd. 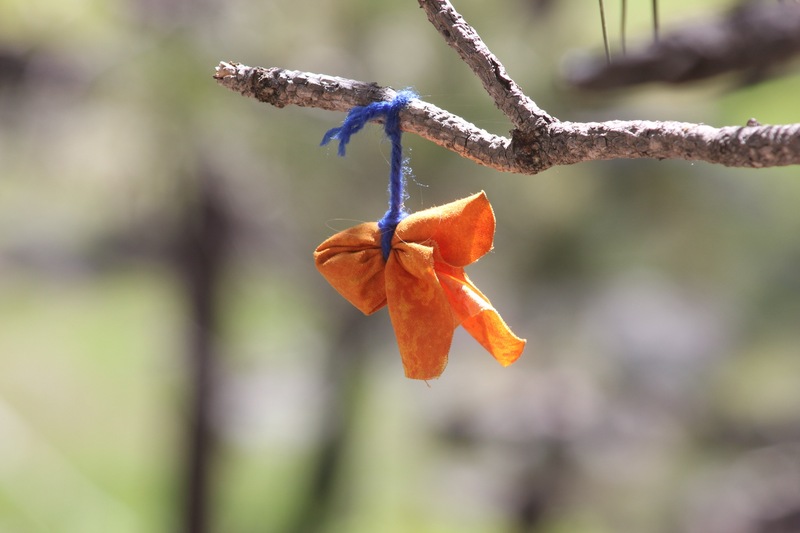 It is easy to make. This is the first time I have made lemon curd, ever. And oh so delicious. 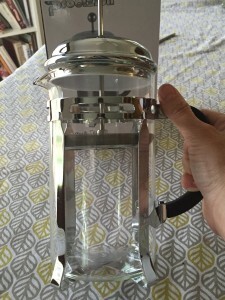 The girl LOVES it…I was almost afraid to put it in the fridge to chill, out of concern that she would devour it. To top off these delectable little numbers I used the lemon butter cream from the Cooking Classy blog and then as a cherry on top—make that lemon slice, I made these fantastic candied lemon slices from Use Real Butter. 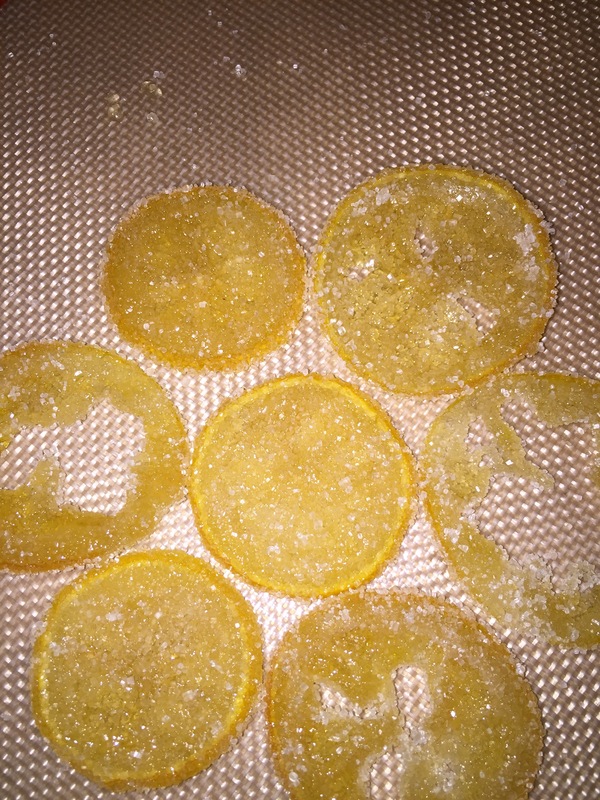 The only modification I made was that after I let these babies dry for about 18-20 hours, I then rolled them in granulated sugar. They are absolutely beautiful and oh so tasty–and aren’t they pretty? The other types of cupcakes I will be making are: Dark chocolate with Sea Salt Caramel and a classic vanilla; I have some research to do. I am sure my family will gladly participate. Both hubby and I had been to Devil’s Tower when we were kids and loved it. We decided to make a stop at Devil’s Tower on our trip from the Black Hills to the Quigley Shoot. 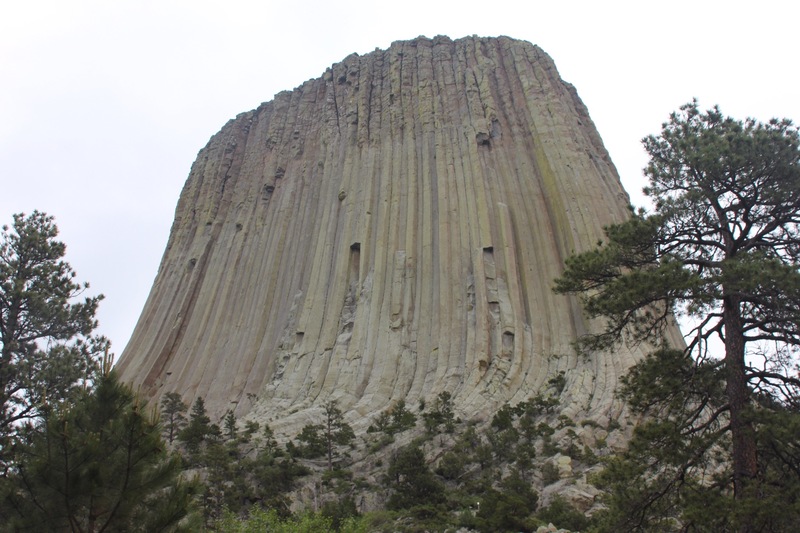 Devil’s Tower is located in Northeastern Wyoming-north of Sundance. It is thought to be a volcanic core that has had the surrounding soil eroded from it. 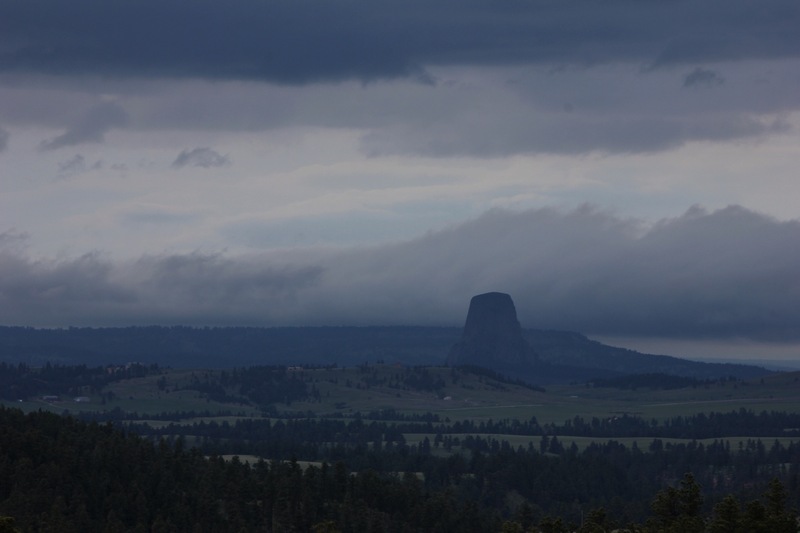 We drove from the Black Hills through some awful fog to get to Devil’s Tower. It was about 7:30 when we finally arrived at the monument. 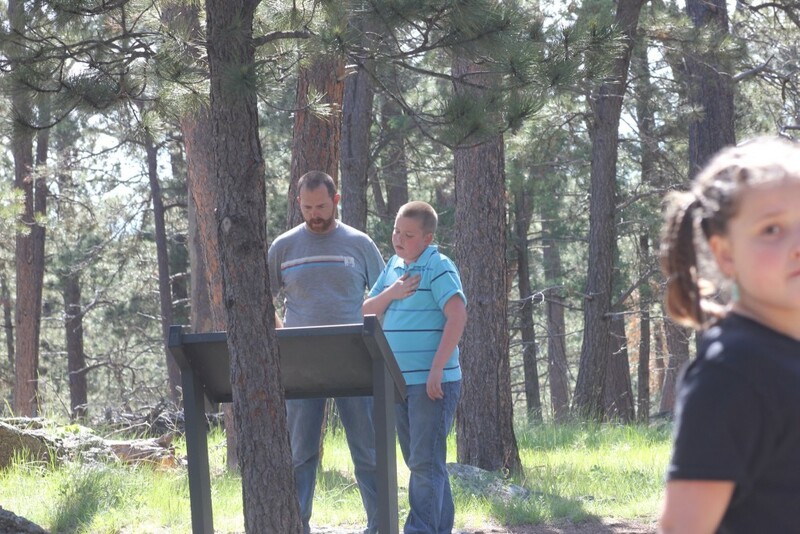 We camped at the Belle Fourche Campground within the monument. What a stunning location! Be warned there are no hook ups, but potable water is available throughout. There is also firewood available for a donation. Pets are welcome but must be leashed (as with nearly every campground). Quiet hours begin at 8 p.m. and all generators must be turned off overnight. The sites are all pull through, though took a bit of maneuvering with our 28 foot travel trailer. At $12/night, it is well worth staying at. Plus the cottonwood trees are giant-great shade trees if you are staying more than just an overnight like we did. In the morning we headed up to the monument headquarters and museum. There is ample parking, though the RV/Trailer Parking is limited. The Tower is so unique. We hiked the 1.3 mile Tower Trail. After all the hiking we did in the Black Hills, this was a lovely easy walk on a paved trail around the base of the tower. Pushing a stroller on this trail would certainly be doable. Along the way there several signs explaining different facets of the monument. Here you see Brent and N looking at one, clearly N is moved. 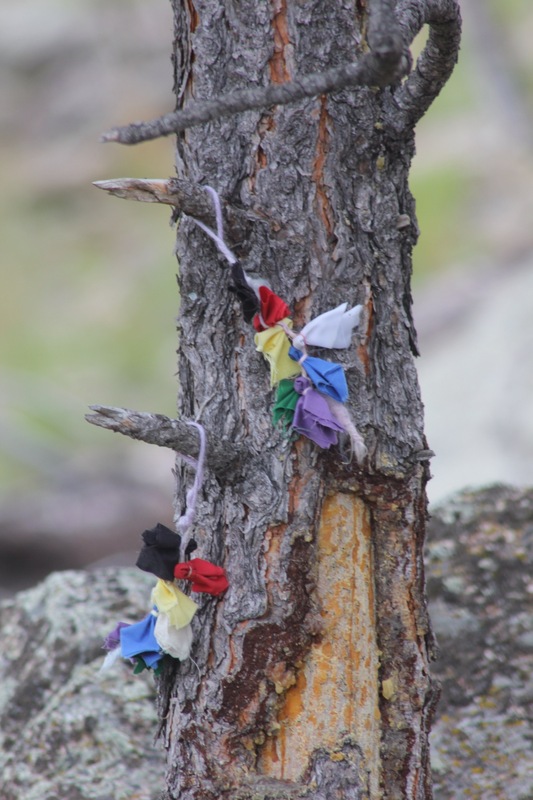 On of the most unique things are the prayer bundles placed around the base of the monument by Native American Tribes. These bundles varied from simple to quite elaborate. I must have taken nearly 100 photos. I am thinking that I will do a couple of canvas prints for my wall. Such a majestic monument. I highly recommend a trip to Devil’s Tower. Go, Hike, Enjoy! 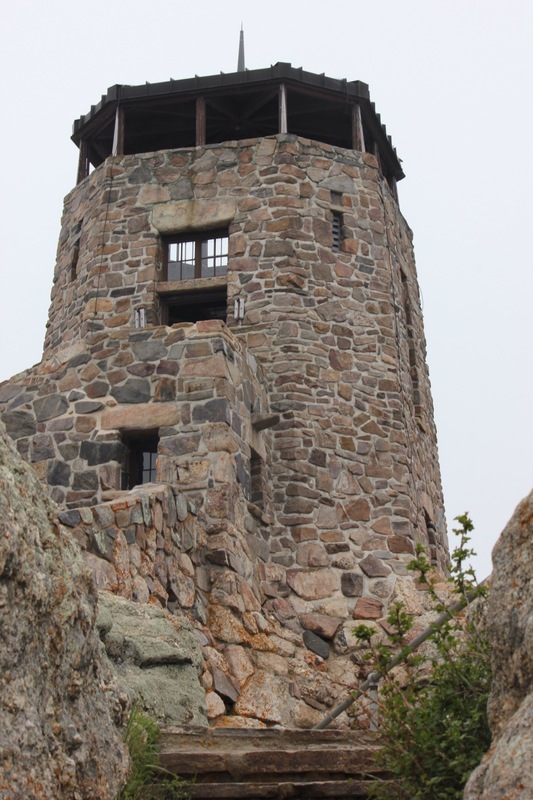 While we were planning our trip to the Black Hills of South Dakota, we decided as a family that we wanted to climb Harney Peak. Harney Peak is the highest point in the state of South Dakota. In fact, it is the highest elevation between the Pyrenees mountains of Spain and the Rocky Mountains. We purchased a map at one of the NFS visitor centers-I am really glad we did as it was really nice to have while we were on the trail. The map we got is water resistant. We folded it so that the portion of the Hills that we were hiking in was showing. For the hike we drove to the Sylvan Lake trail head in Custer State Park. 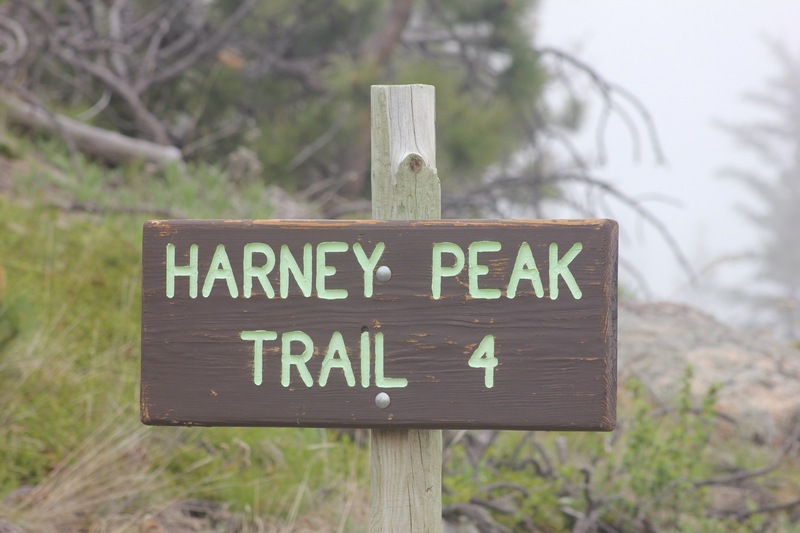 We headed off on Trail number 4 toward the Little Devil’s Tower Trailhead, past the Cathedral Spires Spur and eventually onto Harney Peak. We took the less strenuous Trail number 9 back down to the parking lot. This hike isn’t for the faint of heart. It was strenuous, but worth every step. My biggest regret is that we didn’t do more hiking/walking before hand to be in better shape. We were all pretty sore after our hike, but all of us agree that it was worth it. 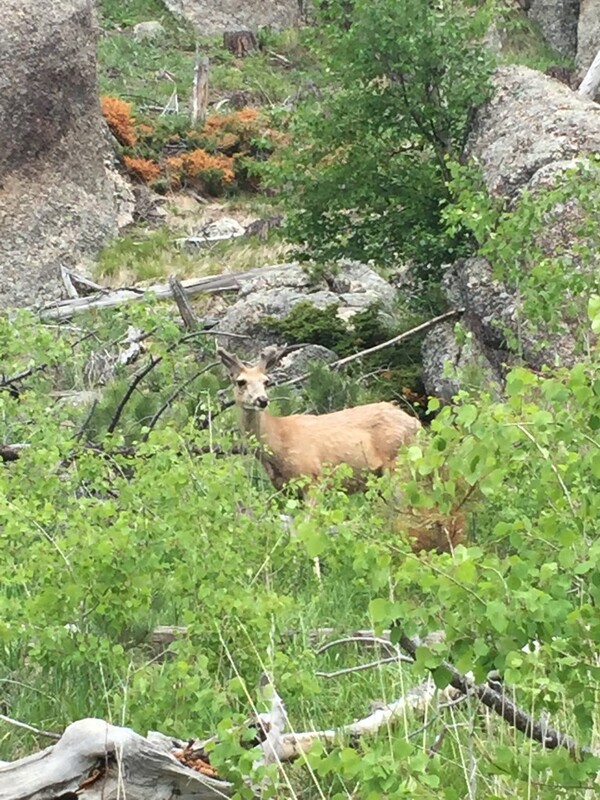 On our way we saw several mule deer including this handsome guy. N & E were so excited to tell hikers that we met about the deer in hopes that they could see him as well. 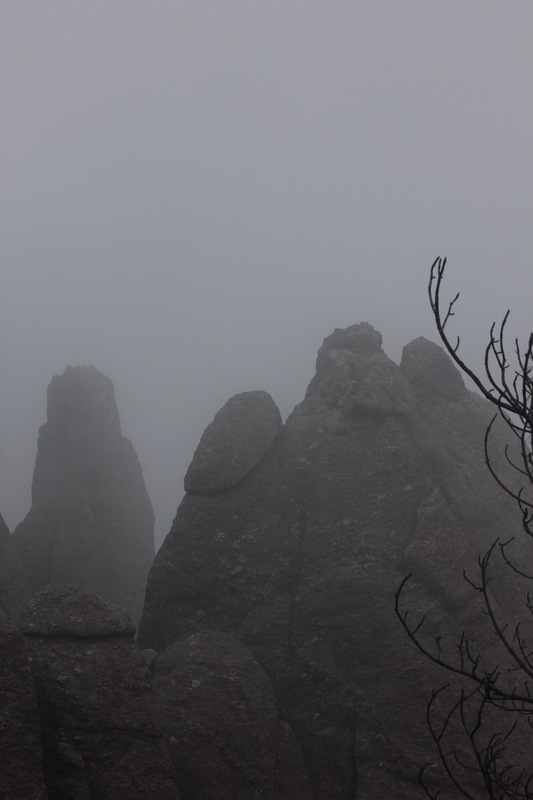 We thought about hiking to the Cathedral Spires, however the clouds were low enough that we thought we wouldn’t be able to see anything. It was a tough hike up to Harney Peak, but what a view! 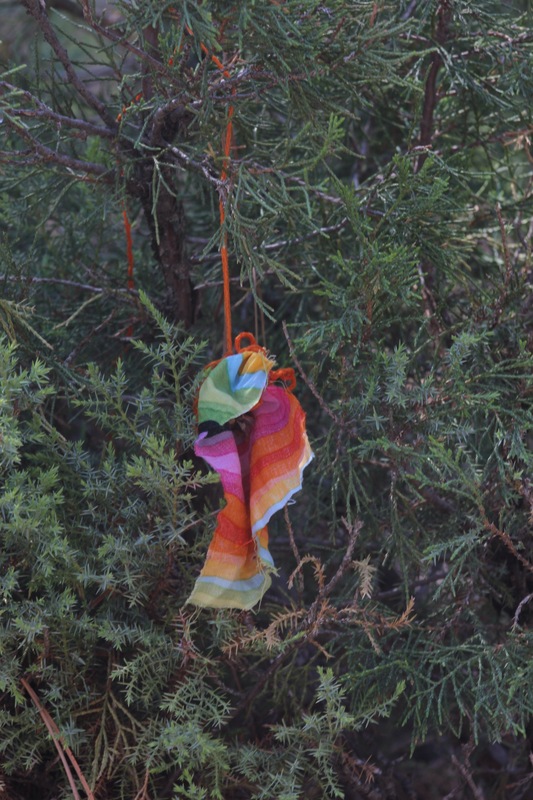 My suggestions to anyone taking this hike on is to make sure you have LOTS of water! We had about 3 Liters for the 4 of us and it wasn’t enough. Bring lots of snacks. Our favorites were beef jerky and our homemade snack bars. 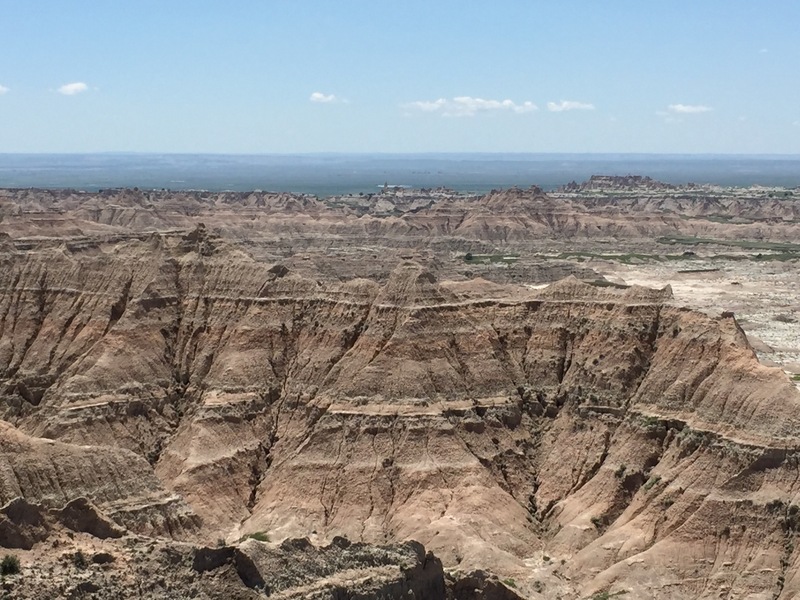 On our trip to Quigley, we spent a day in the Badlands of South Dakota. As a kid we sent a week every summer camping on the Conata Basin. My parents actually spend their honeymoon camping and shooting prairie dogs in South Dakota. Our week on the “Prairie” was something we looked forward to all year long. Some of the people that we camped with out there are life long friends. I was so excited to take the kids to see this amazing part of our country. We first visited the Minuteman Missile National Historic Site. As a kid, I never knew about all the missiles just miles from where we camped. I asked my mom, she said they had no idea about it either. We weren’t able to do the tour of the actual missile tower as they were full long before we got there, however the museum/interpretive center was incredibly interesting. I found it very interesting how close we were to a nuclear war and how it was averted. After we left the Missile site we headed into the Badlands National Park. We drove though the park. We stopped at several of the lookouts and did some hiking. It was fun to see how endless the badlands seem to extend. I highly recommend the Badlands. In fact, I cannot wait to go back and do a longer hike, but we were on our way to our friends’ house in the Black Hills and didn’t have a ton of time. The coolest thing—all of these photos were taken using my new iPhone 6!! As I said before, i have been working hard to replace some of the basic items we use in our home with homemade versions. I love my essential oils and love removing some of the crazy ingredients. I am not a fan of antibacterial soap. I think that we go too far in trying to sanitize our lives. 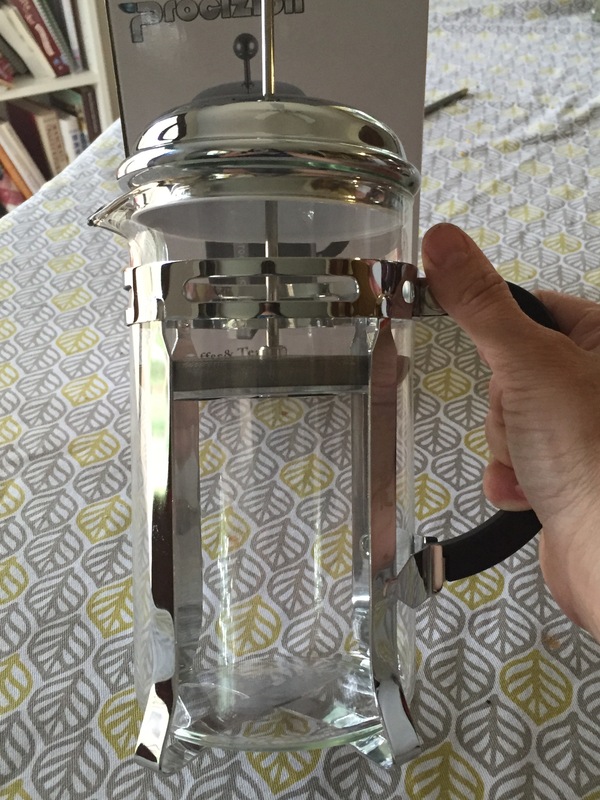 On a recent trip to Target, we purchased a foaming soap dispenser. A quick Pinterest search and I had a recipe in hand. It seems that there are a ton of recipes, but all are very similar. It really is just that easy. I love the smell of the peppermint with the orange. I love my essential oils. 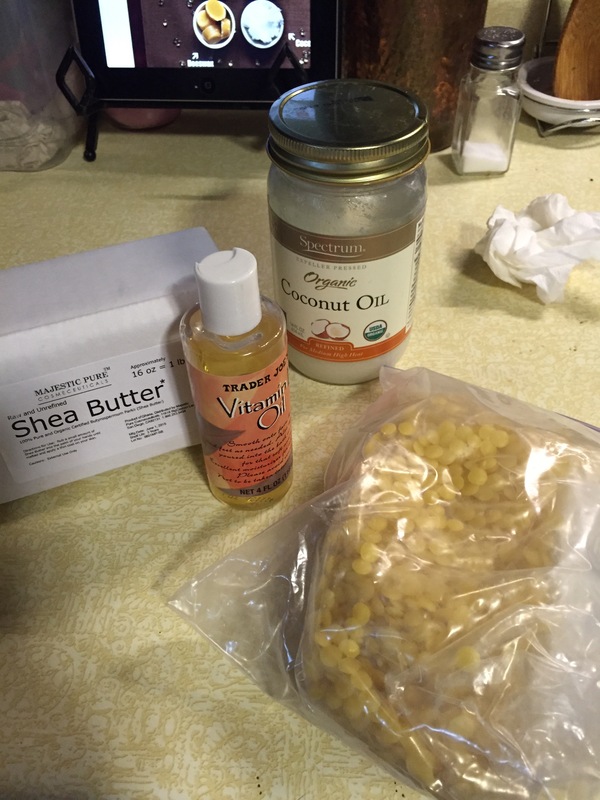 I have been working hard at replacing many of the health and beauty products we buy with ones that we make. I finally decided to take on lip balm. I bought 50 of the cute little lip balm tubes off of the internet quite a while ago. They have been sitting in the closet patiently waiting for me to decide what to do with them. It is easier that I thought it would be. I spent some time yesterday morning sipping the coffee DH made me before he left for work and searching Pinterest for ideas. My favorite lip balm ideas are this recipe from Rambly blog. I guess I need to find some clear labels. My sweet Belle helped me. 1. The plastic one cup Pampered Chef measuring cup does not make an acceptable double boiler…it melts :(. I had that measuring cup for a long time, in fact when we first got it our lab mix Bailey chewed the handle off, but yet we kept it. Now, I believe that its usefulness is gone and it shall be recycled. Boo. 2. A plastic pipette works great for filling the tubes. It just takes a long time. But it works well and there wasn’t a ton of lip balm all over my countertop. 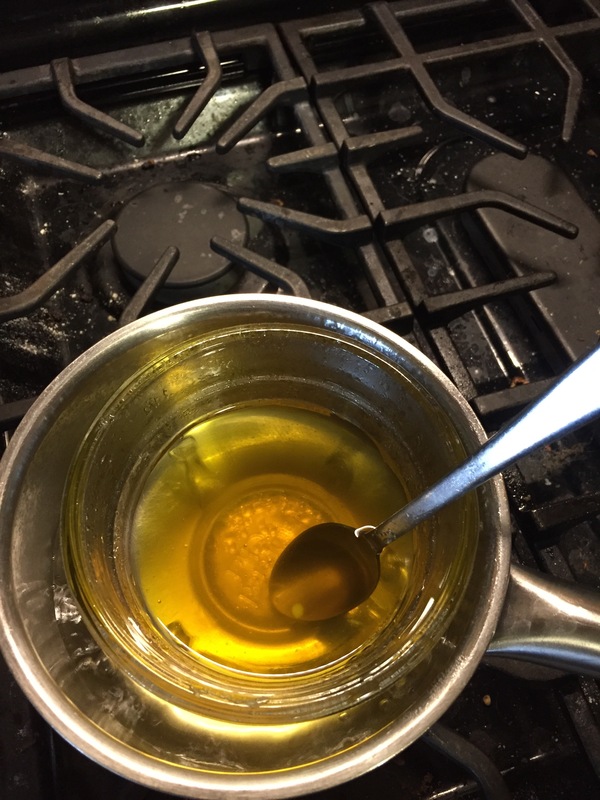 Heat all but the essential oil in a double boiler until the beeswax is melted. Once melted add in the essential oil and stir well. 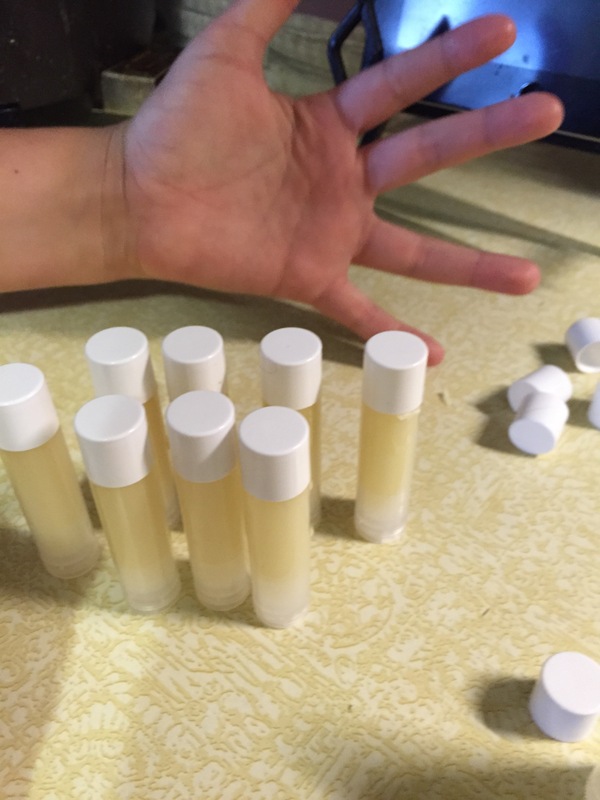 Using a plastic pipette (or small funnel) fill lip balm tubes. 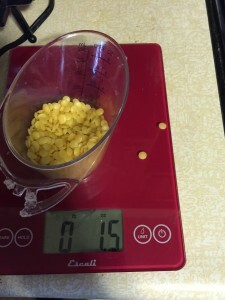 Add caps and place in refrigerator to solidify. Love this stuff! It is so moisturizing. I love the smooth feel it give my lips. I rubbed a little of the extra into my hands, it makes a great lotion as well. I am thinking that these may be great sticks for using on dry skin. 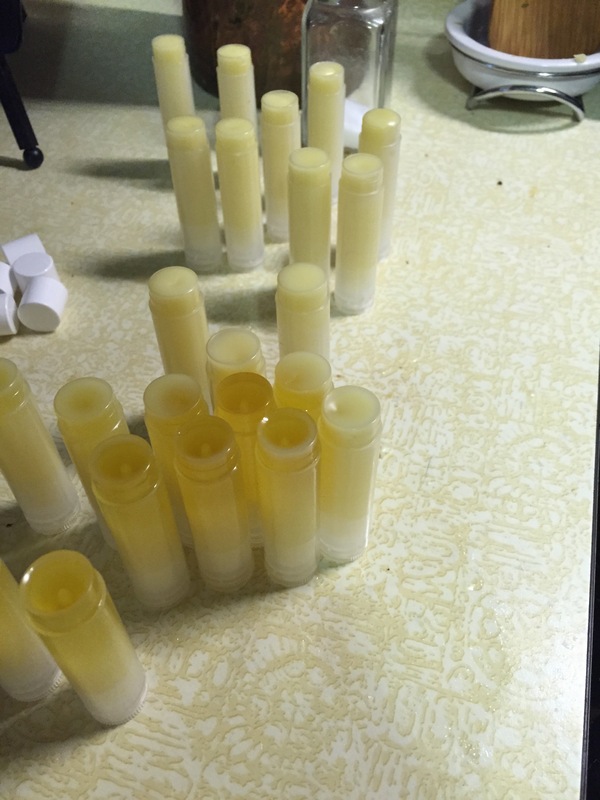 Now to find a good recipe for lip balm to make with my shea butter, maybe something with a little spearmint in it. Pinterest, look out here I come!